Paula Lambie – van Bemmelen (born in Amsterdam, NL, immigrated in 2012) has been engaged with horses ever since the age of 6 and felt a deep connection with them from the very beginning. 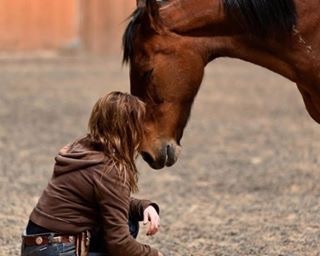 Throughout the years she has developed a special way to connect with and heal horses. She is a Master Certified Integrated Horsemanship and Integrated Riding Instructor & Trainer (4 years education plus a 3 years Master). She is also a Reiki Master Practitioner giving Reiki sessions to horses and people and giving classes (Reiki Initiations) as well. Together with her Twin Flame, Pete Lambie (born in Boston, US) Human Horse Balance was started to be of service, helping humans and horses in various ways. Pete is a Reiki practitioner as well with a unique emphatic, warm and compassionate way. He has an open, sympathetic and understanding heart and ear and is loved and respected by many. He is a mentor/coach to many young people. 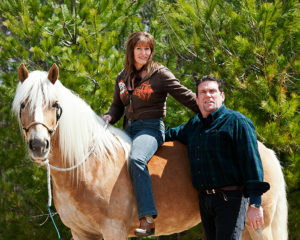 Pete and Paula are building their dream: to have a healing and coaching center, in service for humans and horses. It is their life’s path together. In 2017, the HHB Healing Foundation was created to be in service and help more people by providing horse coaching for the community to facilitate connection, healing and empowerment for those in need. The Foundation operates out of the Human Horse Balance Ranch in Center Conway, New Hampshire. Sponsoring, donations, and contributions to the HHB Healing Foundation are fully tax deductible and greatly appreciated! For more information on the Foundation, please go to http://www.hhbhealing.org. Integrated Riding is a way to work and ride with your horse from your body language and body posture (seat bones and abdominal muscles) in fluid harmony from intention, visualization, mutual respect, understanding and from a communication that is inviting to the horse to fully work together in total balance. Training/solving problems; helping restore the bridge of communication between riders and their horse(s); training horses on various difficulties, problems, blockades or challenges; as well as restoring balance and harmony through awareness are primary goals in her practice. Horses are great teachers, showing us to live in the here and now (as that is where they are) from their unconditional love. Since Paula started her Reiki practice in 2000 she has also helped people young and old to find their inner answers. These answers include spiritual growth, finding their goal and path in life, healing and overcoming blockages such as anxiety, depression, abuse. grief, anger, pain, etc. to become a more whole and aware person. Paula has taken many healing classes and educations (such as TTouch, Quantum Touch, Cranial Sacral Therapy, Healing Massage, DofNA, Voice Dialoque, Braintech, Readings, healing Angel circles, singing bowls, etc.) to expand her range to help humans and horses in a multi modal approach. Pete and Paula are hoping to be of service to you and/or your horse. Feel free to email paulavb@live.nl or phone (603) 716 6335 for further information, we look forward to working with you!